Road Angel Gem Deluxe GPS and Laser based speed camera detectors provide alerts to all fixed and mobile locations such as Laser sites, SPECS, and Gatso cameras via a built-in and automatically updated database. In addition no matter what road you are driving the Gem's screen advises you to the current roads speed limit, how useful is that! The essential difference between the Gem and Gem Deluxe models is the Deluxe model includes extra accessories. Read more here. The Gem has been designed to be a plug and play device. Simply attach to your dashboard via the dash mount. A car charger is also included, though thanks to the built-in rechargeable battery you can run the Road Angel Gem for up to 2.5 hours cable free! Road Angel Gem and Gem Deluxe have both been discontinued. Require accessories for your Road Angel Gem? These are in stock click here to buy. Road Angel Gem and Gem Deluxe speed camera detectors feature GPS, GPRS/GSM and Laser technology all designed to help warn of approaching speed camera and accident blackspot locations across the UK. 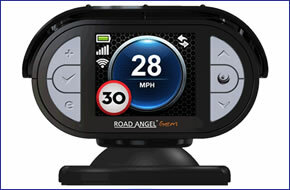 At the heart of the Road Angel Gem is a GPS database of all fixed and mobile speed traps. Unlike most other detectors, which need to be connected to a PC to be updated, the Road Angel Gem doesn't require that, instead it updates itself automatically when and where you need it most - on the road! This is thanks to the built-in GPRS/GSM mobile phone technology (SIM card is included). Even better news - you need do nothing in the update process except pay for the subscription! The Road Angel Gem also features a Laser detector, although mobile speed cameras are included in the GPS database if you come across a LIVE Laser based safety camera Partnership van or handheld gun the Road Angel's Laser detector will also alert you. What's the difference between the Road Angel Gem and Gem Deluxe? The Road Angel Gem Deluxe version is exactly the same as the standard Gem model, the difference is the Gem Deluxe includes extra accessories. These accessories include a carry case, windscreen suction cup mount, hardwire kit (enabling you to hardwire the Gem into your vehicles electrical supply) and 2.5metre USB Cable. You can also buy all of these accessories separately, although buying them bundled with the Gem Deluxe model represents a huge saving! The CameraShare feature allows you at the press of a button to share LIVE mobile speed camera locations with other Road Angel Gem users. Road Angel's database of course includes mobile speed camera locations, but as they appear in different locations at different times pressing the CameraShare button will flag it as a LIVE mobile speed camera location. Other motorists using a Road Angel Gem driving the same section of road will then be notified of the flagged LIVE camera van location for the following two hours. As well as speed camera locations, the Road Angel Gem also features a database of UK road speed limits. So no matter what road you are driving and whether a speed camera is present or not you'll be safe in the knowledge of what the speed limit is! The SpeedShare feature also let you advise new or revised road speed limits at the touch of a button. The SpeedShare feature allows you at the press of a button to advise Road Angel of a differing speed limit to that in the Road Angel speed camera or speed limit database. The database will then be updated to reflect the new speed limit. eAssist or electronic assist utilises the GPRS/GSM connectivity feature of the Road Angel Gem. Should you find yourself in an emergency or SOS situation, pressing the eAssist button connects automatically to a call centre, where you can speak directly with an operator who can best assist you further. At the same time as pressing the eAssist button your GPS location is also sent automatically. So should you require the emergency services, your exact location can also be passed onto them. Do you have a question about the Road Angel Gem that's not been answered on this webpage? Please see our speed camera detector FAQs for questions from other customers and visitors. Plus if the answer to your question isn't featured, use the online form to ask us for the answer. Alternatively please telephone 01733 777623 Monday to Friday (9:30am-5:00pm) to speak to one of our sales team. The Road Angel Gem is easy to install using the provided dash mount and operates independently using power from its internal lithium-ion rechargeable battery for up to 2.5 hours. You can also power the Road Angel Gem directly from the (supplied) 12 Volt USB Car Charger. 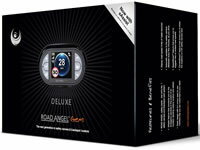 Road Angel Gem comes preloaded with the latest speed camera locations* and is ready to use straight from the box. To provide you with up to the second, realtime, wireless speed camera updates to the Road Angel Gem, Road Angel requires you to subscribe to their database. There are 3 easy ways to pay using a credit or debit card. Whichever version of Road Angel Gem you buy, it comes complete with all the accessories you need to get it up and running in your vehicle. However additional and replacement accessories are also available, these include: windscreen suction cup mount, a vehicle dash mount and vehicle charger adaptor. Question: Can you please tell me if you do sell display for Road Angel Gem? Answer: This part, if available will ONLY be available from Road Angel. You will likely need to return your Road Angel Gem so they can carry out the installation. Do you have a question about the Road Angel Gem? Submit your question via our contact page.